Do you live in or around Stockfield? Are you female? Aged between 7-16 years old? Love or want to try dance for free? Then this a perfect opportunity for you! 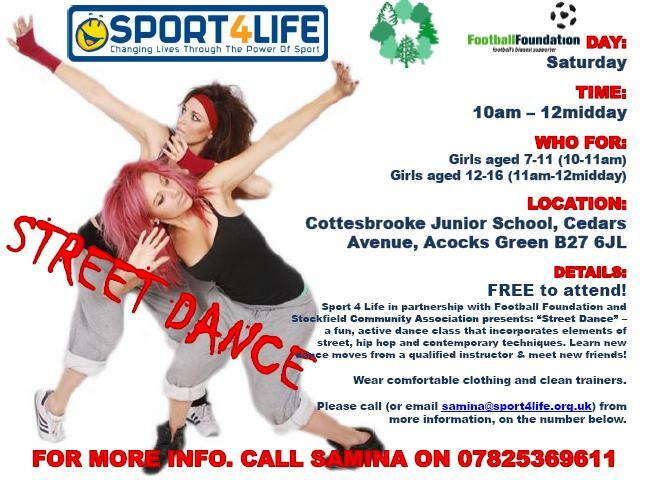 Sport4Life UK, in partnership Stockfield Community Association are delivering dance classes at Cottesbrooke Junior School every Saturday morning FREE OF CHARGE!! A qualified dance instructor is delivering Urban Street Dance to the latest hits in the charts today. The sessions compromise of two groups and sessions are every Saturday morning from 10am-11am (7-11years) and 11am-12pm (12-16 years). They are FREE to attend. The groups will also be working towards a Christmas performance in front of family and friends. This entry was posted in Events and tagged Acocks Green, Birmingham, children's activities, Cottesbrooke Junior School, dance, dance classes, girls, Sport4Life, Stockfield, Street dance. Bookmark the permalink.